Squad Goals: Can A Girl Get a Monument? Soooo. Monuments, right? Hot topic right now! Did you think we wouldn’t go there? Too soon? Easy for him to say, he has tons tonnes of statues. Not to be one, but like, if there’s sooo many memorials out there, why are there so few statues of women? I’d hardly bring it up, and I hate to be a bother, it’s just, you know, we are half the population…incubators of the human race…all the nuns AND all the Victoria’s Secret models in the world… and 100 percent of Beyoncé. Surely out there, somewhere, is a lady worth commemorating with a statue. Seeing how things are going, it’s probably not going to become a common practice in America any time soon. In the meantime, though, Canada is holding down the fort – five times over. Even though they’re called the “Famous Five” in the Great White North, I’m sure you have no idea who they are because they’re Canadian, AND women, AND there’s five of them, AND no, it’s not the Spice Girls. And no, it’s not the English children’s literature series of the same name. Allow me to introduce you to your new best friends! Emily Murphy was a magistrate who would go on to become the first female judge in the British Empire. That’s right! First, baby! Irene Palby was the founding president of United Farm Women of Alberta and was the second woman in the British Empire to serve as cabinet minister. Second is also good! 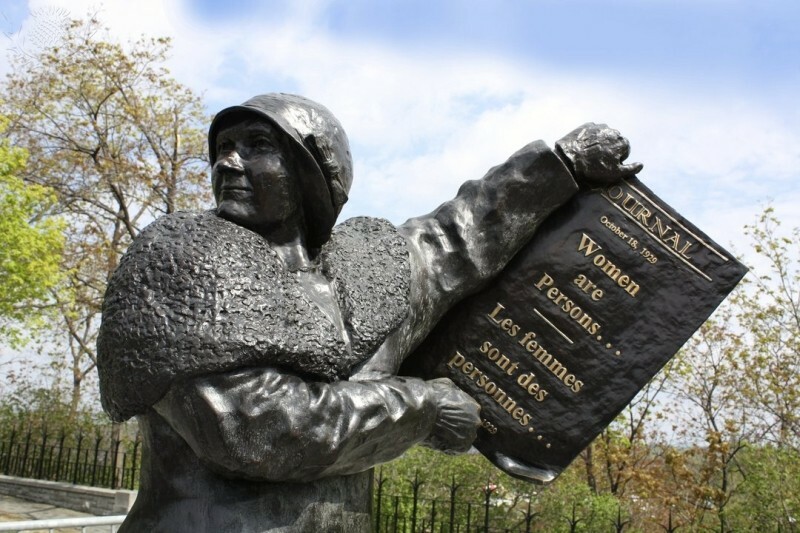 Nellie McClung was the first woman elected to the CBC’s Board of Governors and the only woman representative at the League of Nations in 1918. O-N-L-Y you only! Yeah yeah you only! Louise McKinney was one of the first two women elected to any lawmaking body ever in the British Empire. First again! First of two, I’ll take it! Henrietta Muir Edwards was chairman of the Committee in Law of the National Council of Women. It’s her meeting, you know it! Henny at the head of the table! And together, they were movers and shakers. Now, they were not in agreement with each other all the time, and in fact you, here in 2017, might strongly disagree with some of their stances on immigration, eugenics, and alcohol and drug legislation (what a sentence). But one thing they were sure of is that women needed to have more of a say in policy, regardless of what that say might say. But despite being five brilliant and politically-minded people, there was one thing they couldn’t figure out for themselves. And you know women: nag nag nag. They took it all the way to the Supreme Court to get an answer. In case you’re not up-to-date on your Canadian legislation, Section 24 refers to who can run for Senate. And, spoiler alert, the Supreme Court ruled that “persons” does not include women. Flattering! The Supreme Court did not. Women had gotten the right to vote in 1920, but 7 years later the courts were still dragging their feet on updating other relevant legislation like who could serve in the Senate. (And as we know, down here in the U.S. for a long time the only way a woman could serve in the Senate was over her husband’s dead body). Women could serve in the Canadian House of Commons, arguably a much more powerful role when it came to actually changing legislation, as of 1921, but the Supreme Court was evidently a stickler about the Senate. Perhaps it was the wording, and considering females to be persons was just too radical to even consider. Go Nelllllls! Her name is Nellie and she know what she got! (What do she got?) She got a team that’s hotter than hot! (How hot is hot?) Voting rights and senate seats too! (Uh huh uh huh) We’re gonna make a statue out of you! Women jumped at the chance to serve: just four months after the ruling, Cairine Reay Wilson of Quebec became Canada’s first female senator.